"It is not what method i choose , but whether i dissolve or not that matters"
Udai rightly mentioned a couple of times regarding conditioning and how by slowing down and observing what is taking place one can gain clarity(I have paraphrased)...this is indeed a useful thing to do in the course of our discussions as well...it will help if we give space and time for each other to understand what we are trying to convey...and it will be better to give a simple statement of what we wish to convey rather than proceeding in a question answer fashion...yes,the questions can be helpful after we have ascertained that we are on the same page to view the questions objectively. In a lighter vein,am reminded of the joke...A tamilian visited Andhra Pradesh(during the pre split times!) and boarded a bus...the bus was crowded and he had to stand near the door and as the bus halted at the next stop,a Telungu passenger with an umbrella in hand got down hurriedly and the handle of the umbrella got hooked to the ear of the tamilian who howled in pain 'Kaadhu' 'Kaadhu'(meaning 'Ear' 'Ear')...The Andhra man thinking that the other man was referring to the umbrella(kaadhu means umbrella in Telungu) responded 'naadhu,nasdhu' (mine ,mine). I know kaadhu means 'ear' in tamizh...not sure whether it is umbrella in Telungu but this is how the joke got shared...Udai will be in a position to validate this as he knows Telungu..I see a parallel to this sort of a thing in the ongoing discussion in the other thread...ha ha. In telugu umberella is called "Godugu" . Most of our disagreements are definitely vocabulary differences , i have no doubts about that. that said, there is really no need to take these discussions or disagreements too seriously. I treat my day to day life as a long dream, these discussions are even less real if at all. When there is sincerity , even if there are a few wrong ideas, those will soon dissolve in the presence of God. infact some times different views may help people at different stages of life as well. I have heard the story of Bilvamangala. He was so attracted to a prostitute that once when there was a storm and very heavy rains he could not but meet the prostitute. so he went in dark night and along the way he found a boat to cross a small lake/pond and then he reached there to and caught hold of a rope hanging from her balcony to reach her, since she could not hear the door knock. the bewildered lady asked "how did you reach here"
and he explained the whole story. when they went here to see they saw a python hanging from the balcony , it was not a rope. and then they saw a dead body for the boat. she simply said "even a little bit of this kind of attraction for God would have liberated you"
and that one comment changed his life for ever. yes all that attachment was unreal ... but even all these statements are unreal... ultimately what matters is somehow one wades their way through all this and dissolves in the Self to live in bliss ever after.
" I was listening to Nochur Venkataraman ji and he speaks Atma Darshanam, Ishvara Darshanam and Krpa Darshanam or the darshanam of Grace - and Krpa is the highest actually "
I heard his talks on Aksharamanimalai. i cannot understanding tamil, so have heard the english lectures. it has definitely changed me a lot. A young man in his mid-twenties knocks on the door of a renowned Guru. He says: ?I?ve come to you because I wish to study Vedas.? ?Do you know Sanskrit?? the Guru asks. ?No,? replies the young man. ?Have you studied any Indian philosophy?? ?No. But don?t worry. I just finished my doctoral dissertation at Harvard on Socratic logic. So now, I would just like to round out my education with a little study of the Vedas.? ?I doubt,? the Guru says, ?that you are ready to study Vedas. It is the deepest knowledge ever known. If you wish, however, I am willing to examine you in logic, and if you pass that test I will teach you Vedas.? Guru holds up two fingers. ?Two men come down a chimney. One comes out with a clean face; the other comes out with a dirty face. Which one washes his face?? The young man stares at the Guru. ?Is that really a test in logic?? ?The one with the dirty face washes his face?- he answers confidently. ?Wrong. The one with the clean face washes his face. Examine the logic. The one with the dirty face looks at the one with the clean face and thinks his face is clean. The one with the clean face looks at the one with the dirty face and thinks his face is dirty. So, the one with the clean face washes his face.? ?Very clever,? the young man says. ?Give me another test.? The Guru again holds up two fingers. ?Two men come down a chimney. One comes out with a clean face, the other comes out with a dirty face. Which one washes his face?? ?We have already established that. The one with the clean face washes his face.? ?Wrong. Each one washes his face. Examine the logic. The one with the dirty face looks at the one with the clean face and thinks his face is clean. The one with the clean face looks at the one with the dirty face and thinks his face is dirty. So, the one with the clean face washes his face. When the one with the dirty face sees the one with the clean face wash his face, he also washes his face. So, each one washes his face.? ?I didn?t think of that,? says the young man. It?s shocking to me that I could make an error in logic. Test me again.? The Guru holds up two fingers. ?Two men come down a chimney. One comes out with a clean face; the other comes out with a dirty face. Which one washes his face?? ?Each one washes his face.? ?Wrong. Neither one washes his face. Examine the logic. The one with the dirty face looks at the one with the clean face and thinks his face is clean. The one with the clean face looks at the one with the dirty face and thinks his face is dirty. But when the one with the clean face sees the one with the dirty face doesn?t wash his face, he also doesn?t wash his face. So, neither one washes his face.? The young man is desperate. ?I am qualified to study Vedas. Please give me one more test.? He groans, though, when the Guru lifts two fingers. ?Two men come down a chimney. One comes out with a clean face; the other comes out with a dirty face. Which one washes his face?? ?Neither one washes his face.? ?Wrong. Do you now see why logic is an insufficient basis for studying Vedas? Tell me, how is it possible for two men to come down the same chimney, and for one to come out with a clean face and the other with a dirty face? Don?t you see? The whole question is nonsense, foolishness, and if you spend your whole life trying to answer foolish questions, all your answers will be foolish, too.? The ego that thinks, 'I must do this,' or, 'I should not do that,' is no longer there. The Self simply animates you and makes you do all the things that need to be done. If you are not in this state, then use your discrimination wisely. You can choose to sit in a flower garden and enjoy the scent of the blooms, or you can go down to that trench I told you about and make yourself sick by inhaling the fumes there. So, while you still have an ego, and the power of discrimination that goes with it, use it to inhale the fragrance that you find in the presence of an enlightened being. If you spend time in the proximity of a jnani, his peace will sink into you to such an extent that you will find yourself in a state of peace. If instead, you choose to spend all your time with people whose minds are always full of bad thoughts, their mental energy and vibrations will start to seep into you. I tell you regularly, 'You are the Self. Everything is the Self.' If this is not your experience, pretending that 'all is one' may get you into trouble. Advaita may be the ultimate experience, but it is not something that a mind that still sees distinctions can practice. 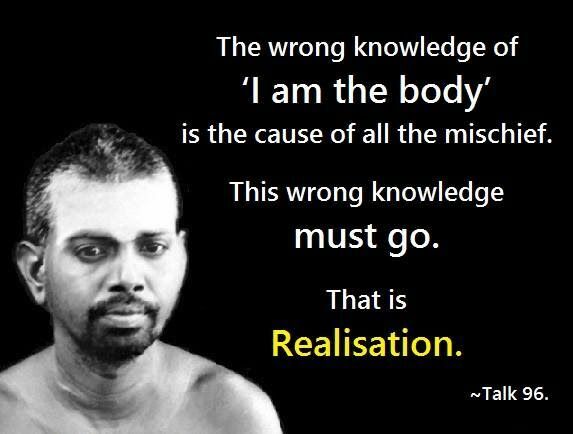 You need a body that is in good working order in order to realize the Self. Realizing the Self is the only useful and worthy activity in this life, so keep the body in good repair till that goal is achieved. Afterwards, the Self will take care of everything and you won't have to worry about anything anymore. In fact, you won't be able to because the mind that previously did the worrying, the choosing and the discriminating will no longer be there. In that state, you won't need it and you won't miss it. Question: How do I give up identification with the body, particularly when I am not in front of Swami? I keep practicing, but I don't have that experience. Annamalai Swami: Meditate ?I am the Self?. If you do this, the idea that you are the body will go. 'I am the Self? is still an idea, and as such, it belongs in maya, along with all other ideas. But you can begin to conquer maya by giving up utterly wrong ideas that bind you and cause you trouble. How to do this? Replace them with ideas that are a better reflection of the truth, and which are helpful in leading you towards that truth. If you want to cut iron, you use another piece of iron. ..
Sadhana is a battlefield. You have to be vigilant. Annamalai Swami: Constant meditation is the only way. If you bring the light into your room, the darkness immediately goes away. You have to see that the light is not put out. It has to be continuously burning so that there is no darkness. Until you get firmly established in the Self, you have to continue with your meditation. Doubts take possession of you only if you forget yourself. Question: Sometimes I am overpowered by self-doubt. Annamalai Swami: If the meditation is not continuous enough, the other part of the mind becomes predominant. You have to overpower this mind that is taking you away from yourself by repeatedly doing this self-inquiry. When you churn curd and separate butter and buttermilk, they will not become one again after they have been separated. If you take milk from the cow's udder, it will never go back into the cow again. In the same way, if you become established in the Self, you will never go back into ignorance again. Question: Has man any free will or is everything in his life pre-destined and pre-ordained? Sri Ramana: Free will holds the field in association with individuality. As long as individuality lasts, there is free-will. All the sastras (scriptures) are based on this fact, and they advise directing the free will in the right channel. Find out to whom free will or destiny matters. Abide in it. Then these two are transcended. That is the only purpose of discussing these questions. To whom do these questions arise? Find out and be at peace. 77. Shine Thou selfless, sapping the pride of those who boast of their free will, Oh Arunachala! His face was red with rage. ?What a fool you are!? he told me. ?What do you think you have come to Bhagavan for?? The day he understood his Self Realization, Sadhu Natanananda went incognito. The outward symbol of his becoming Self-realized was his obscurity. He lived alone ? happy to be immersed in the Self all the time. After Bhagavan?s mahasamadhi in 1950 and until 1967, many did not even know if Natanananda was still alive. Though he stayed in a cottage in Tiruvannamalai, no one knew where he was. Like most of the old devotees, I too thought that he had passed away. I had spent seven years in the ashram when suddenly one day my friend Dorab Framji asked me, ?Do you know Sadhu Natanananda is alive?? I jumped with joy because I loved his book, Spiritual Instruction, also known as Sri Ramana Darsanam. I paid him a visit. He was an austere man with nothing in his room except for a few loincloths. He blessed me and asked, ?What are you doing? Are you practicing Self-Enquiry?? I replied, ?I am not capable of doing Self-Enquiry. I only chant Arunachala Siva, Arunachala Siva.? His face was red with rage. I was taken aback because this was my very first meeting with him and I was accustomed to people indulging me whenever they met me. Not Natanananda! He was a stern and serious man. He raged, ?What a fool you are! What do you think you have come to Bhagavan for? For what function has he chosen you? It is only to make you like him! Read his Forty Verses on Reality, practice Self-Enquiry, BE the truth. That is why you have been chosen!? I was stunned in disbelief. Thoughts will come as long as the potential for them is inside you. Good thoughts, bad thoughts, they will all keep coming. There is nothing you can do about this flow, but at the same time, this flow of thoughts need not be a problem. Be the Self, be the peace that is your real nature, and it will not matter what comes up. Walk, eat, drink, sleep, meditate, but never think that you are the one who is doing these things. The thought that you are doing something is the thought that is poisoning your life. Because once you think that you are doing something, you will start to think that you need to be doing something else to put yourself in a better situation. You don't have to do anything to experience the nectar of the Self. All you need to do is drop the idea that you are doing anything at all.